I and several of my CEI colleagues were looking forward to an informal debate late Friday afternoon on energy policy sponsored by McKinsey and Company, the global consulting firm. As part of their “Drinks and Debate” series, McKinsey’s Washington, DC office invited David Kreutzer of the Heritage Foundation and Joe Romm of the Center for American Progress’s Climate Progress blog to make some remarks and then take questions from an audience of around 40 people representing all shades of the political spectrum. It sounded like a lot of fun because Romm often seems enraged and slightly deranged in his frequent blog posts, but unfortunately Romm cancelled at the last minute. 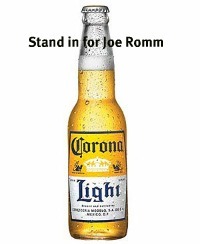 Our host explained that Romm had pulled out without giving a reason and that his side of the debate would be represented by a bottle of Corona Light. It was still fun: David Kreutzer gave an engaging and stimulating presentation, as he always does, and the bottle of Corona Light proved to be more rational and less misleading than Romm. The very idea that man is polluting the environment driving automobiles is one of many baseless environmentalist fears. CO2 is NOT pollution nor the cause of Global Warming. It is a very minor constituent in our air which causes the plants that nourish us to grow and enables us to live on this planet. By the way, beer is a required drink for all good geologists. If I had to have a Corona, I’d take Corona Gold. As for enRomm – A light beer likely has the greater intellect. Friday Funny – carbonated drink stands in for Joe Romm in debate | Watts Up With That?